When trying to manage work files, I get a "Connection to File Server is absent" or "Socket Error #10061"error. How do I fix it? On the server machine, please go into "Task Manager >> Services" and make sure that the service "Projetex3DFileSrv" is both present and active. If it is not there, please run the program's installer again (do not uninstall the server software, just install it again over itself). If the problem still persists, please try opening port 47111 in the firewall, on both the server and the workstation. 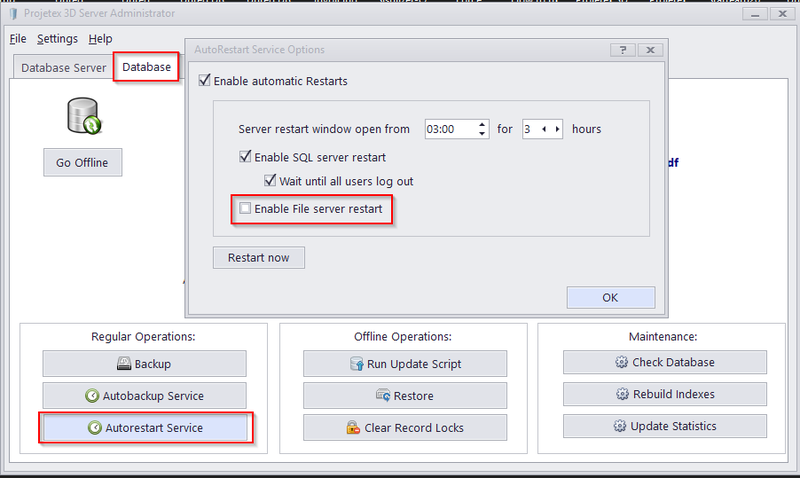 If the problem reoccurs every day, please open the Server Admininstrator, go to "Database >> Autorestart service" and disable the option "Enable File server Restart", then activate Projetex3DFileSrv once more.